To find out if what happened to leaky reservoirs in West Seattle and Beacon Hill could happen to Capitol Hill’s Lincoln Reservoir, you’d have to rip up Cal Anderson Park, remove the grass and the dirt and the rocks, the swing sets and the benches and the fountains. Only then could you do the testing necessary to find out if the Capitol Hill reservoir is leaking. “We couldn’t do it without removing the park,” said Seattle Public Utilities spokesperson Andy Ryan. West Seattle Blog has learned that Seattle Public Utilities has ordered waterproofing work dug up and redone at two newly covered city reservoirs — Myrtle Reservoir here in West Seattle and Beacon Hill Reservoir — because of hundreds of leaks discovered in the “membranes” applied to both projects. Ryan said that even though the same contractor, designer and manufacturer also teamed on the Capitol Hill reservoir, SPU currently has no plans to dig up Lincoln to test it for leaks, also. “There are no leaks and no disagreement between the contractor and the designer and the product manufacturer like there is in West Seattle and Beacon Hill,” Ryan said. Both the West Seattle and Beacon Hill reservoir projects are much earlier in their lifecycles than the capping of Lincoln. Ryan said that when SPU inspectors were reviewing the Beacon Hill project in September they noticed drips forming on the reservoir walls. Testing revealed hundreds of small perforation in the mebrane used to help contain water in the reservoir. Similar testing at the Myrtle Reservoir revealed the same problem. But to do the same testing on Lincoln Reservoir, Ryan said the capped water system would need to be accessed and all the dirt and grass from the park above, removed. For the leaking reservoirs, Ryan says that this isn’t a water quality issue for SPU but a construction quality issue. “There’s been extensive testing done on the drinking water and it meets standards,” Ryan said. 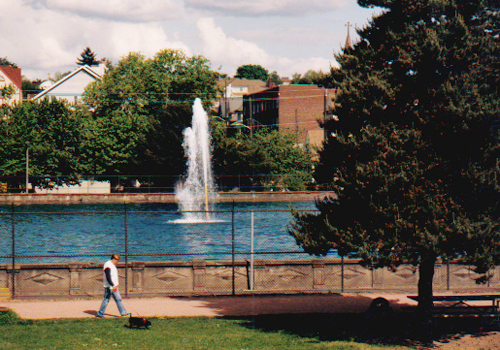 Lincoln Reservoir was capped in 2003 and topped with Cal Anderson Park which opened in 2005 as part of a city parks levy project.